Diabetes Expo 2017 is brought to you by the Canadian Diabetes Association and Dauphin Clinic Pharmacy. 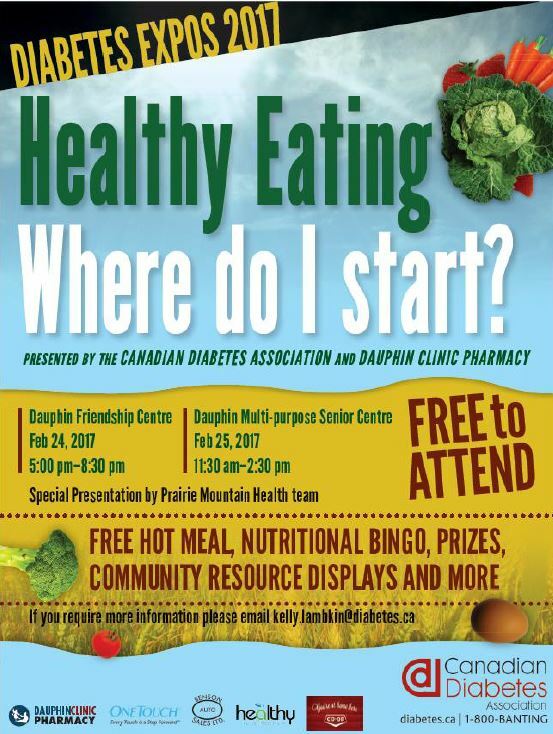 Diabetes Expo headliners and the Diabetes Team at Prairie Mountain Health will be performing their hit: "Healthy Eating - Where do I start?" It will be held on Friday February 24 at the Dauphin Friendship Centre from 5:00pm - 8:30pm and Saturday February 25 at the Dauphin Multi-Purpose Senior Centre from 11:30pm - 2:30pm. Both days feature a free hot lunch, nutritional bingo and prizes, as well as community resource displays. It is free to attend and everyone is welcome.